The climate of Mayotte is tropical, with a hot, humid and rainy season from December to April, when the north-west monsoon prevails, and a relatively cool, dry and sunny season from June to October, when the south-east trade winds prevail, while May and November can be considered as transitional months. Mayotte is an archipelago consisting of two main islands, Grande-Terre (or Maore) and Petite-Terre (or Pamanzi), plus some smaller islets. 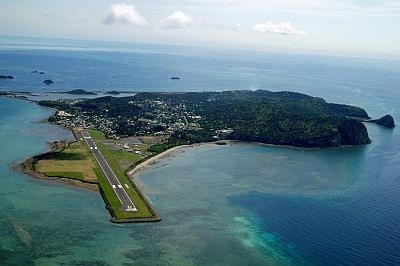 The archipelago is an overseas department of France and is located in the Indian Ocean, at a latitude of nearly 13 degrees south. The average daily temperature ranges between 27 °C (81 °F) in the warmest period (January-April) to 23/24 °C (73/75 °F) in the least warm period (June-September). From June to September, the temperature never exceeds 32 °C (90 °F), while from November to March it can sometimes reach 34/35 °C (93/95 °F), morevoer, high humidity in this period makes the heat uncomfortable. Here are the average temperatures on the main island. The total annual rainfall is not very high, and amounts to 1,200 millimeters (47 inches) on the small island of Pamanzi, and 1,400 mm (55 in) on the main island, most of which occur from October to May; the rainiest month is January, when the rains are definitely abundant. Even during the rainy period, however, the amount of sunshine is acceptable because the tropical rains occur mainly in the form of downpours or thunderstorms, which can be intense but do not last long. However, the sunniest period is the dry and cool one, as can be seen in the following table. During the dry period, some brief thunderstorms are still possible, especially on the main island, where there are some small elevations: the highest point is Mount Benara, 600 meters (2,170 feet) high; in addition, the archipelago is protected by Madagascar, which is located at just 300 kilometers (185 miles) to the south-east. The sea in Mayotte is always warm enough to swim in, in fact the water temperature fluctuates from 26 °C (79 °F) in the July-September period, to 29 °C (84 °F) in the February-April period. Mayotte is located in the path of tropical cyclones, which can affect the islands from November to mid-May, with a greater chance from late December to mid-April. The best time to visit Mayotte for a beach holiday is from June to October: the temperature is pleasantly warm, the sun frequently shines and the rains are rare. In winter (June to August): bring light clothes, a sweatshirt for the evening, a scarf for the breeze. When going to the reef, you can bring snorkeling equipment, including water shoes or rubber-soled shoes. In summer (December to February): bring tropics-friendly, loose-fitting clothing, light shirts and pants of natural fibers (cotton, linen), a light sweatshirt for the evening, a light raincoat or umbrella for the rain showers.